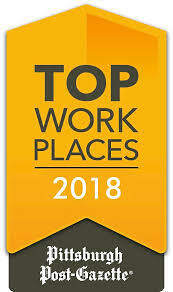 Pittsburgh Post-Gazette has recognized 94 companies and organizations in Pittsburgh as Top Workplaces for 2018. These companies have been recognized based solely on surveys about the workplace completed by their employees. Creating a top workplace is about more than offering great benefits and vacation time. It’s about organizational health. Employees want to align with the company’s vision, be challenged by a high-performance culture, and feel that they are valued and that their voices are heard. The Covestro Center for Community Engagement is proud to have partnered with many workplaces listed this year, including Grossman Yanak & Ford LLP, Bank of America Merrill Lynch, Mainstay Life Services, and Koppers Inc.